Starting in iOS7, there is additional space at the top of my UITableView's which have a style UITableViewStyleGrouped. 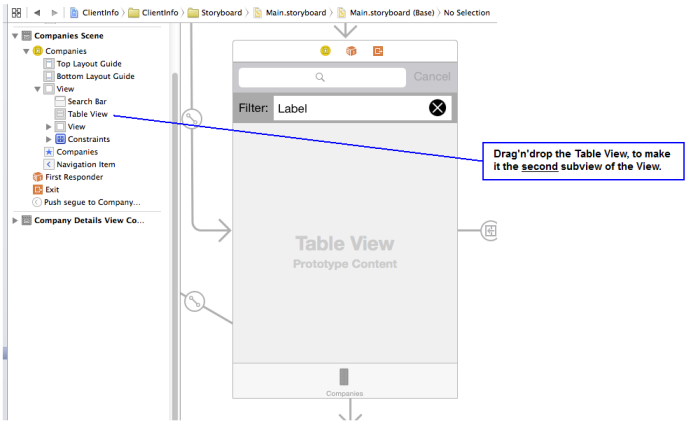 The tableview starts at the first arrow, there is 35 pixels of unexplained padding, then the green header is a UIView returned by viewForHeaderInSection (where the section is 0). Can anyone explain where this 35 pixel amount is coming from and how I can get rid of it without switching to UITableViewStylePlain? YouStoryboard.storyboard > YouViewController > Attributes inspector > Uncheck - Adjust scroll view insets. I played around with it a bit more and it seems like this is a side-effect of setting the tableView's tableHeaderView = nil. I like this solution better than setting a somewhat arbitrary contentInset.top because I use the contentInset.top dynamically as well. Having to remember to remove an extra 35px whenever I recalculate contentInset.top is tedious. Try changing the contentInset property that UITableView inherits from UIScrollView. try, you can deal with it! I have found the cause of my original bug and created a sample project showcasing it. I believe there is an iOS7 bug. As of iOS7, if you create a UITableView with the Grouped style, but do not have a delegate set on first layout, then you set a delegate and call reloadData, there will be a 35px space at the top that will never go away. no space at the top. It's like the tableView is caching a result somewhere and not redrawing itself after the delegate is set and reloadData is called. 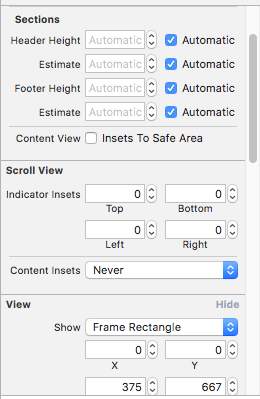 Uncheck "Adjust Scroll View insets"
Another quick comment... even in XCode 6.1, there is a bug with vertical spaces appearing at the top of UIScrollViews, UITextViews and UITableViews. Sometimes, the only way to fix this issue is to go into the Storyboard and drag the problem control so it's no longer the first subview on the page. According to this transition guide for iOS7 by Apple, the scroll view’s content insets is automatically adjusted. The default value of automaticallyAdjustsScrollViewInsets is set to YES. The UIViewController which has the UITableView should set this property to NO. This also removes the extra padding on the top. A lot of the previous answers above are too hacky. They would break at anytime in the future if Apple decides to fix this unexpected behavior. a UITableView doesn't like to have a header with a height of 0.0. If what's you're trying to do is to have a header with a height of 0, you can jump to the solution. even if later you assign a non 0.0 height to your header, a UITableView doesn't like to be assigned a header with a height of 0.0 at first. Then, the most simple and reliable fix is to ensure that your header height is not 0 when you assign it to your table view. You can get rid of top and bottom paddings by implementing the following methods from the UITableViewDelegate. In my case this was what helped me. I'm supporting ios6 also. A Boolean value that indicates whether the view controller should automatically adjust its scroll view insets. Default value is true, which allows the view controller to adjust its scroll view insets in response to the screen areas consumed by the status bar, navigation bar, and toolbar or tab bar. Set to false if you want to manage scroll view inset adjustments yourself, such as when there is more than one scroll view in the view hierarchy. My answer is going to be more general answer, but can be applied on this as well. framework will automatically set pre-calculated contentInset. but in my case I wasn't able to do this, because I was implementing SDK which has UIView component which can be used by other developers. That UIView component contains UIWebView (which has UIScrollView as the first subview). If that component is added as the first child in the UIViewController's view hierarchy, automatic insets will be applied by system. I've fixed this by adding dummy view with frame (0,0,0,0) before adding UIWebView. I'm assuming that is just part of the new UITableViewStyleGrouped styling. It is in all grouped table views and there doesn't seem to be any direct way to control that space. 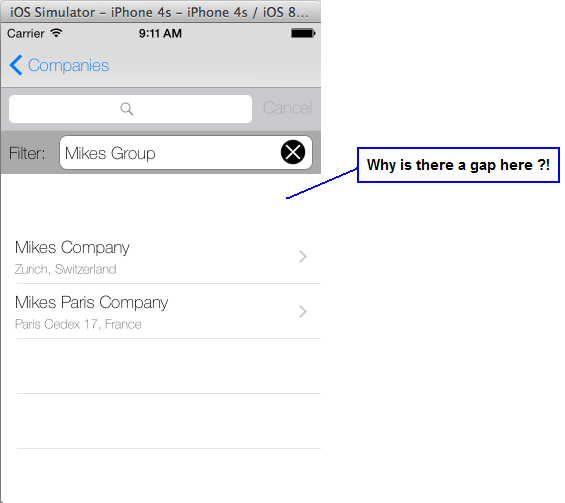 If that space is being represented by a UIView, it would be possible to search through all the subviews of the UITableView to find that specific view and edit it directly. However, there is also the possibility that that space is just a hardcoded offset before headers and cells start and there won't be any way to edit it. I had the same fix as arielyz. Once I moved the UITableView to be not the first subview of the parent view, it went away. My space was 20 px, not 35. I wasn't able to recreate it in a portrait xib, only a landscape xib. I'll file a radar bug later if I can reproduce it in a simple demo app. I think making UIEdgeInsets -35 0 0 0 is tedious. In my case, I implemented tableView: heightForHeaderInSection: method and it has a potential to return 0. When I changed 0 to 0.1f, the problem just went away. 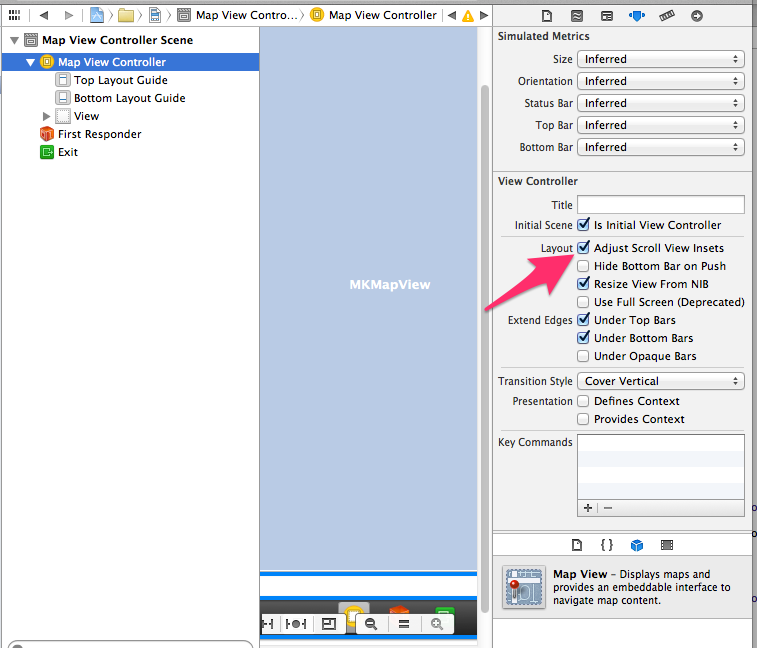 YouStoryboard.storyboard > YouViewController > Select TableView > Size inspector > Content insets - Set it to never. We have multiple answers for this. Not the answer you're looking for? Browse other questions tagged ios uitableview ios7 or ask your own question. iOS 7 status bar back to iOS 6 default style in iPhone app? Default section header for UITableViewPlain? How to scroll to top in IOS7 UITableView? How To Get Rid Of Extra Space Above The UITableViewStyleGrouped Section?